BSNL 198 Junior Telecom Officer JTO (Electrical) JTO (Civil) Posts Recruitment Notification 2019. BSNL 198 JTO Posts 2019 Recruitment Notification, BSNL to recruit engineers, online application opens March 6th 2019. 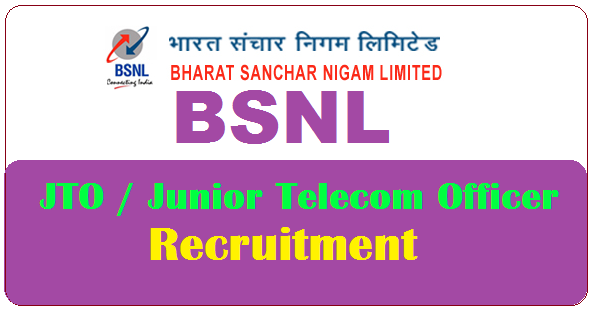 Bharat Sanchar Nigam Ltd. (BSNL) is going to filling up 198 posts of .Junior Telecom Officer /JTO. Registration process for the candidature of Direct JTO (Electrical) JTO (Civil) in BSNL will start with effect from 11th February 2019 to 13h March 2019 through online BSNL portal i.e. www.externalexam.bsnl.co.in. Recruitment for Graduate Engineer to the post of JTO Junior Telecom Officer in BSNL from Open Market through valid GATE Score 2019. BSNL Proposes to recruit 198 posts of Junior Telecom Officer(JTO) in the IDA pay scale Rs.16400-40500/- through valid GATE SCORE 2019. The Candidates having qualification BE/BTech or equivalent in Telecom/ Electronics/ Radio/ Computer/ Electrical/ Information Technology/ Instrumentation Engg. or MSc Electronics/ MSc Computer Science are required to appear GATE Exam 2019, opting one paper from selected four disciplines of GATE paper codes i.e CS and IT/EC/EE/and IN. Details are available at www.gate.iitr.ernet.in. Bharat Sanchar Nigam Limited, BSNL has invited candidates to fill up Junior Telecom Officer, JTO (Civil) & (Electrical) posts. Candidates willing to take up this job position can apply through the official site of BSNL at bsnl.co.in. A total of 198 posts of JTO will be filled up. The last date to apply for the position is till March 12, 2019.
a. Educational Qualification: BE/BTech. or equivalent in Civil Engineering for JTO(Civil) & in Electrical Engineering for JTO(Electrical) from a recognized Institution/University AND are required to appear in GATE exam 2019, opting one paper from selected two disciplines of GATE paper codes i.e. Electrical(EE) & Civil(CE). b. Nationality: Only Indian Nationals would be eligible to apply. Age Limit: 18 to 30 years as on 31st January, 2019. 16,400-40,500/- with annual increment@ 3% of basic pay plus IDA, HRA, Perks, Medical Benefits, etc admissible as per company rules. Mode of selection : The mode of selection is through GATE SCORE-2019 which has to be conducted by IIT Madras, Chennai in the month of February 2019. Recruitment for Graduate Engineer to the post of JTO Junior Telecom Officer in BSNL from Open Market through valid GATE Score 2019. Candidates will have to pay Rs 1000/- if belonging to OBC category and Rs 500/- if belonging to SC/ST category. All the candidates willing to apply for the job should have GATE registration ID. For more details on the job post, candidates can visit the official notification available here. Candidates can apply through the official site of BSNL. posts are required to read all the instructions provided on website www.bsnl.co.in before filling the online application form. BSNL Corporate Office, New Delhi during office hours.